Non Alkaline Battery, usually Black Cat by Eveready Analog Man carries the Boss/Ibanez style 9V or 12VDC Power Supply. 9Vdc 100mA power supply for most Boss/Ibanez type pedals. All analogman battery powered effects with power jacks also use this adaptor. Analog Man carries the Electro-Harmonix 18DC-500 Power Adapter. Analog Man sells the Ernie Ball Power Supply EB6195 Power Supply for 9VDC powered pedals in the USA. Made for the Ernie Ball Wah Pedal 6185 Analog Man carries the Boss PSA-120S 9vDC Power Supply. 9V dc 500mA digital switching type power supply for higher power Boss/Ibanez type pedals. Analog Man sells and installs P3 Technology - The Phantom Power Pedal System - Makes Batteries & Power Cables 100% Optional! 9v outputs x 8 and 18v outputs x 2. Analog Man sells theThe new Dunlop M239 Mini Iso Brick multi-power supply. 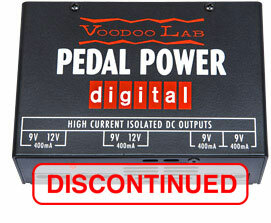 5 fully-isolated outputs for DC powered pedals at several voltages Analog Man carries the Voodoo Lab Pedal Power Digital power supply.. 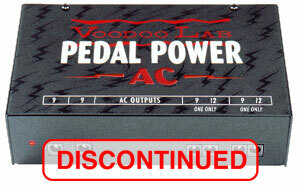 The new Pedal Power Digital is a linear (analog) power supply for high-current DSP-based pedal effects and accessories. Has 4 completely isolated, filtered, and regulated output sections. 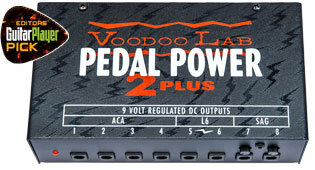 Analog Man carries the Voodoo Labs Pedal Power 2 Plus power supply. Sorry we can not sell any foreign versions, only the 120V AC USA version of the PP2. Analog Man carries the Voodoo Labs Pedalpower 4x4. Audiophile quality analog power for your high-current digital pedals and 9-volt battery classics! Analog Man carries the MXR Talk Box M222. A real talk box that does nor require an external amplifier and messy speaker wiring. Analog Man sells and installs P3 Technology - The Phantom Power Pedal System - Makes Batteries & Power Cables 100% Optional! P3 Phantom Pedal Power Station is used if your amp does not have P3 built in. Sends power to your pedals. Analog Man carries the Pedaltrain Powertrain 1250. With selectable input voltage (115v or 230v)operation you can confidently use your powertrain1250 anywhere in the world to power many pedals. Analog Man carries the Eventide Power Factor. PowerFactor will simultaneously power up to 3 Eventide Stompboxes plus up to four additional pedals. Has 10 outlets configured in 7 isolated sections. Analog Man sells the Dunlop Cry Baby Rack mount Wah pedal DCR2SR. Adjustable sweep frequency range, variable "Q" control, adjustable boost. Connect up to six controllers!